Make Model: BEHRINGER BLE400. Ishibashi Music Corporation. EMS is safe, fast (approx. ). 1-4 Weeks Yes! Our Products are 100% Authentic. Pedal was bought new and used once. Works great. Behringer Composer PRO Compressor Model MDX-2200. Condition is Used. Shipped with USPS Priority Mail. 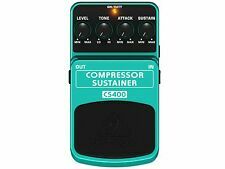 BEHRINGER COMPRESSOR/SUSTAINER CS400. You can dial in the right amount of compression using the dedicated ATTACK and SUSTAIN dials. TONE lets you add exactly the right level of highs. This BEHRINGER product has been designed to compete head to head with leading products on the market. What's a Compressor?. Dynamics play an important role in music. This is partly due to physics. Easy to Use You can dial in the right amount of compression using the dedicated ATTACK and SUSTAIN dials. Model : CS400. MPN : CS400. Middle East Free! 100% Authentic! Asia Free! 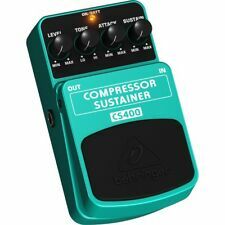 A seguire elenchiamo le principali caratteristiche di questo effetto compressore sustainer a pedale - switch elettronico on/off per l'integrità del segnale in modalità bypass. per le quali i corrieri applicano una maggiorazione tariffaria. Compressore / limiter CL9. Pedale effetti classico compressore / limitatore. EFFETTO COMPRESSORE SUSTAINER A PEDALE. La dinamica svolge un ruolo importante nella musica.